Small Size and big performance: It’s the most compact of the line Breathing Air, easy to transport to its low weight, allows refill even in hard to reach places, both the model Atlantic P Electric is the model with Atlantic G gasoline engine. 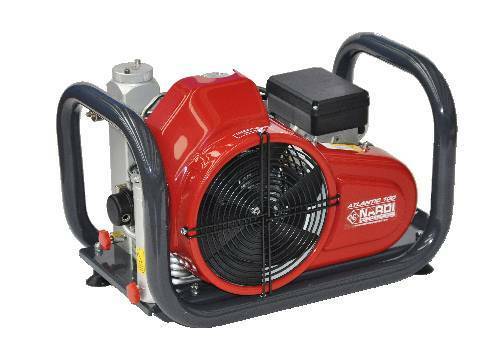 Air quality is always very high, thanks to those little tricks that only Nardi Compressors are able to plan. 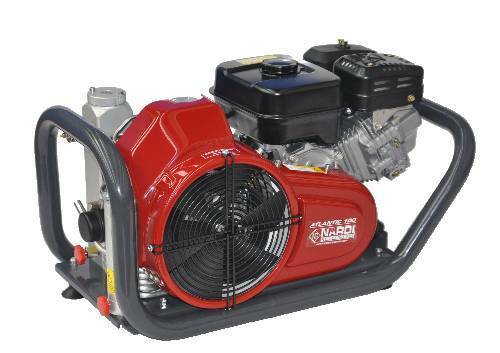 Available in 3.5cfm, with electric motor single phase, three phase or with internal combustion engine Robin-Subaru. Features: Pressure valve standard on every model; coated aluminum frame; interstage condensate separator designed to decrease the condensation between one stage and the other in a position well aerated to maintain the low temperature; crankshaft perfectly balanced; pressure 3000 psig or 4500 psig; high quality materials and are resistant to thermal and dynamic stresses; air conveyor designed for a high heat exchange efficiency; steel valves for longer life and greater performance; filter cartridge with a properly sized for air quality always at the top; Low noise and vibration to a minimum with the perfect balance of the pump unit; reliable electric motors designed and built by Nardi Compressors specific for each model type; separation filter for specific models paintball; specific voltages on request. Small Size and big performance: It’s the most compact of the line portable air compressors, easy to transport to its low weight, allows refill even in hard to reach places, both the model Atlantic P Electric is the model with Atlantic G gasoline engine. Not for Breathing Air. Features: Pressure valve standard on every model; coated aluminum frame; interstage condensate separator designed to decrease the condensation between one stage and the other in a position well aerated to maintain the low temperature; crankshaft perfectly balanced; pressure 4500 psig; high quality materials and are resistant to thermal and dynamic stresses; air conveyor designed for a high heat exchange efficiency; steel valves for longer life and greater performance; filter cartridge with a properly sized for air quality always at the top; Low noise and vibration to a minimum with the perfect balance of the pump unit; reliable electric motors designed and built by Nardi Compressors specific for each model type; separation filter for specific models paintball; specific voltages on request.